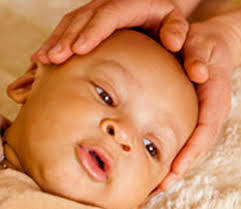 Using a soft touch generally no greater than 5 grams, or about the weight of a nickel, practitioners support the craniosacral system in improving the functioning of the central nervous system by complementing the body's natural healing processes. A suggestion made by a Doctor, Lactation Consultant . . .
One or both parents are anxious or worried all the time. The clinics alternate between Berkeley and S F on the second Sunday of every month. If you are interested in bringing your child, please click on the link below and fill out the form. The week before the clinic you will hear if your child has a spot. This is a great opportunity to experience Craniosacral work and get to know a community that supports newborns and their families! Please contact us for an initial assessment. Home or Hospital visits can also be arranged on a case by case basis. A travel fee will be added according to the distance.